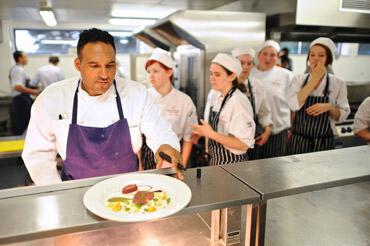 Michael Caines MBE is one of Britain’s highest profile chefs. He is based at Gidleigh Park, the prestigious 2-star Michelin country house hotel on the edge of Dartmoor at Chagford, Devon. In partnership with hotelier Andrew Brownsword, Michael and Andrew are currently in the process of creating a group of individual boutique ABode hotels throughout the United Kingdom which will each have a Michael Caines Restaurant, Michael Caines Champagne and Cocktail Bar, MC Café Bar, MC Boutique and/or MC Tavern. Born in Exeter in 1969 and adopted into a large and loving family, Michael gained his passion for food from his mother who he used to enjoy helping in the kitchen. Michael studied catering at Exeter College where his precocious talent was already evident, earning him the accolade ‘Student of the Year’ in 1987. 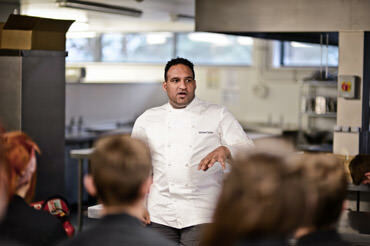 He subsequently spent an influential three years under his mentor Raymond Blanc at Le Manoir aux Quat’Saisons in Oxfordshire, before moving to France for a further couple of years, learning his profession under the guidance of such superstar chefs as the late Bernard Loiseau in Saulieu and Joël Robuchon in Paris. With his classical French training in some of the finest restaurants in the world, and utilising the best and freshest local produce and products from the West Country, Michael has created a style that is uniquely his own, at once classic yet also highly innovative, a fact recognised with the award of a second Michelin star in 1999. In 2001 he won Chef of the Year at the prestigious Cateys Awards. Even with all the on-going activities and developments, Michael continues to cook regularly at Gidleigh Park and alongside his head chefs in Exeter, Chester, Manchester and elsewhere. Says Michael, "Cooking is my passion. I love it and I can never see not being in the kitchens." Gidleigh Park Winner Sunday Times, Hardens Top 100 Restaurants 2010, Best Restaurant, Best Place to Stay and Best Wine List.